Crafting deals from a century old downtown bank to a warehouse to grow this millennium’s medicine and more, in this 24th annual MacRo, Ltd. Newsletter. The Fall 2018 MacRo Report, which includes our exclusive Frederick commercial real estate and Mid-Maryland market insights, hit area mailboxes earlier this week, and is now available for download. 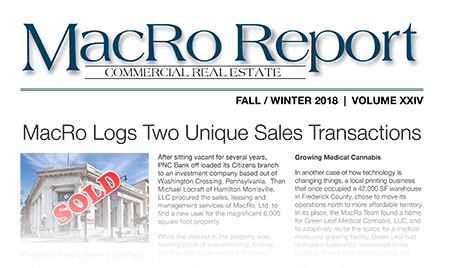 Since 1993, the MacRo Newsletter has a long history of providing actionable commercial real estate data and analysis, and it continues to be one of the most respected and valued resources for property owners, investors, businesses, residents, qualified buyers and tenants. Download your free MacRo Newsletter Today!